The narrator inhabits a paranoid dystopia where nothing is as it seems, chaos seems to rule all events, and everyone is deeply suspicious of everyone else. In danger of losing his mind, the protagonist starts keeping a diary, and it is this diary which details only a few days in his life that is ultimately found by a future society and given the title Notes from the Neogene. 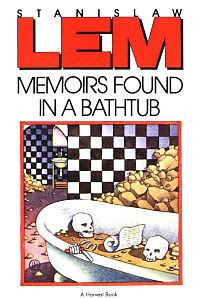 Memoirs Found in a Bathtub is this distant voice from the past, this Notes from the Neogene. "I'll tell you. You're young, but you're one of us, and I'm one of us, so I'll tell you. Everything. Now, say someone's one of us. . . but he's also—you know—you can tell, right?" "He's not—one of us," I said. "Right! You can tell! But sometimes—you can't tell. You think someone's one of us, but they got to him and then he wasn't any more—and then we got to him, and he was—but he still has to look like he isn't, that is, like he only looks like he is! But they get wise to him and—now he isn't again, but he has to look like he isn't—or we'll get wise—and that's a triple!" The audiobook is missing the introduction... which explains the how the memoirs were found. It's inexcusable they left it out. Plus, it's actually about late-era capitalism. Read the introduction if you can and it will all make sense. That makes so much more sense. I can't believe they left out the introduction! It would have been so much better if they had included it!